Yukon Gear & Axle (“Yukon”) warrants the original retail purchaser that all Yukon products will be free from defects in materials and workmanship for the periods shown herein. Yukon makes no other warranty of any kind, express or implied. All other warranties, including but not limited to an implied warranty of merchant ability or fitness for a particular purpose, are excluded. This warranty is offered provided that the Yukon product has been installed and maintained in accordance with Yukon instructions, and that it has not been subject to modification, accident, abnormal use or misuse. At Yukon’s discretion, this warranty may be voided if installation of Yukon product(s) occurs on vehicles with tires that exceed Yukon Maximum Recommended Tire Size. Upon notification of a warranty claim, Yukon shall investigate the claim of defect, and, in the event ofa verified defect, shall, at their sole choice, either repair the defective product or replace it. This warranty does not cover, and Yukon shall not be liable for, incidental or consequential damages, including loss of time, road service charges, labor charges, inconvenience, loss of vehicle use, loss of revenues, or loss or damage to personal property (including loss or damage to vehicle parts due to the failure of the Yukon product)*. In addition, this warranty does not cover, and Yukon shall not be liable for, any undertaking, representation, or agreements made by dealers or other third parties selling Yukon Gear & Axle products, except where such agreements are within the provisions of this Warranty statement. Also, this warranty does not cover damage to the axle caused by or facilitated by failure of a non-Yukon component. This agreement offers you specific legal rights. You may also have other rights which vary from state to state. *See the Yukon Best Warranty in the Business for collateral claims on Zip Lockers and Grizzly Locker. USA Standard Gear® (“USA Standard”) warrants the original retail purchaser that all USA Standard products will be free from defects in materials and workmanship for the periods shown herein. USA Standard makes no other warranty of any kind, express or implied. All other warranties, including but not limited to an implied warranty of merchantability or fitness for a particular purpose, are excluded. This warranty is offered provided that the USA Standard product has been installed and maintained in accordance with USA Standard instructions, and that it has not been subject to modification, accident, abnormal use or misuse. 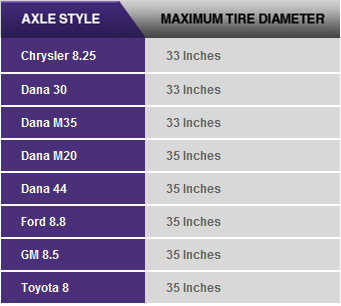 At USA Standard’s discretion, this warranty may be voided if installation of USA Standard product(s) occurs on vehicles with tires that exceed USA Standard Maximum Recommended Tire Size. Upon notification of a warranty claim, USA Standard shall investigate the claim of defect, and, in the event of a verified defect, shall, at their sole choice, either repair the defective product or replace it. This warranty does not cover, and USA Standard shall not be liable for, incidental or consequential damages, including loss of time, road service charges, labor charges, inconvenience, loss of vehicle use, loss of revenues, or loss or damage to personal property (including loss or damage to vehicle parts due to the failure of the USA Standard product). In addition, this warranty does not cover, and USA Standard shall not be liable for, any undertaking, representation, or agreements made by dealers or other third parties selling USA Standard Gear® products, except where such agreements are within the provisions of this Warranty statement. Also, this warranty does not cover damage to the axle caused by or facilitated by failure of a non-USA Standard component.